create my own variation, using my favorite brownie recipe and my favorite flavor, almond extract (and also because sometimes I can’t be bothered with all the accommodations in making a baking recipe “light”). So, I came up with this, and I’m already a little addicted to it (meaning I’ve made it twice in the last week). I thought there may be someone else out there who would love this combo as much as I do. Note: these are not cakey brownies at all–they are quite dense and fudgy. Preheat oven to 350. Line a 9 x 13 baking pan with nonstick aluminum foil (a great choice for this recipe), or greased aluminum foil, allowing the foil to hang over the pan by 2″ on the sides (so that you can pull the brownies out easily). In a large saucepan over low heat, melt the chocolate and the butter until smooth and combined. Take off heat and allow to cool. While the chocolate mixture cools, make the cheesecake filling. Combine the cream cheese, 1/3 c. sugar, egg, and extract in a mixing bowl (it’s important to have the cream cheese and egg at room temperature, or the mixture will curdle. You can warm cream cheese in a microwave, sans the wrapper, of course, and you can warm an uncracked egg in a bowl of warm water). Whip at high speed until combined, and no lumps remain. When chocolate mixture has cooled, stir in the 2 c. sugar and vanilla, followed by the eggs, one at a time. Add the flour and nuts, if using, and scrape the batter into the prepared pan. Then, dollop the cream cheese mixture over the brownies, at various intervals and sprinkle the chopped cherries (or dollop on the jam) around the pan. With a butter knife, swirl the mixture by making ribbon-candy waves one direction in the pan, then turn the pan, and make the waves the other direction. Swirl until your satisfied with the design:) Cook the brownies in the preheated oven for 25-30 minutes, or until a toothpick comes out with just a couple of crumbs. Place the pan on a rack to cool, and then remove the brownies with the aluminum-foil handles. Refrigerate the extras (they’re even better the second day–more fudgy!) Let me know if you like these! Oh wow, these are so rich! . I made these last night & they are already half gone. The cream cheese to brownie ratio is about 1 to 1 (much higher than the mixes I’ve been using for cheesecake brownies–yeah, I dare admit that on this blog), accounting for a good deal of the yummy richness. I used strawberry preserves instead of cherries. It worked okay but I think next time I will try melting the jam first in order to spread it out more evenly. There will definitely be a next time, and I might not even wait for cream cheese to go on sale. 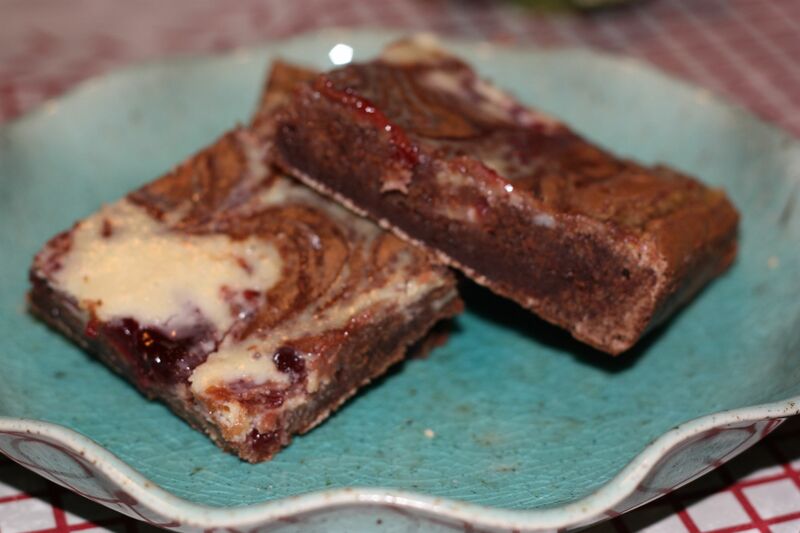 I just tried the cheesecake filling and some raspberry jam on top of my usual brownie recipe (because I’m a cocoa girl, although I know the real chocolate ones are better), and it was so amazingly good! Thanks! Hope your brownies turned out great, Debbi! Thanks for posting!